Difference between revisions of "Define Tigerstripe Annotations"
In order to use this new Annotation Scheme in a Tigerstripe install, we need to package up this plugin so it can be installed as any other Eclipse plugin. To do that, we need to "export" the plugin (link on the right-bottom of the main view of the plugin.xml editor). 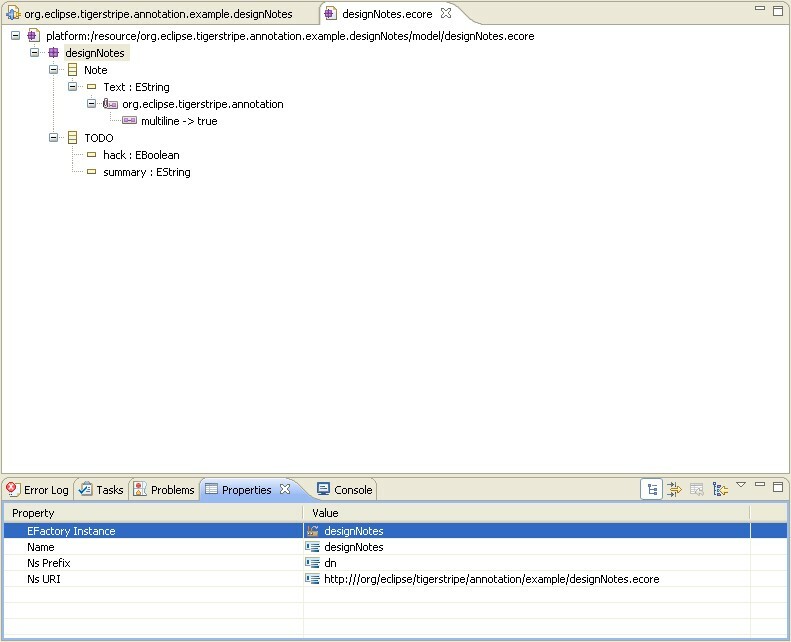 The result is a .jar file that needs to be copied in the "plugins/" directory of your target Eclipse install. Eclipse needs to be restart so it picks it up. You will notice the "Annotation Property View" at the bottom of the Tigerstripe perspective. This view will update upon selecting elements in the workspace. 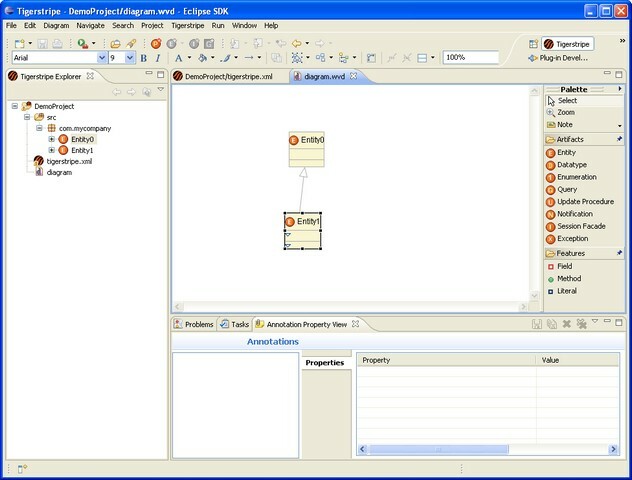 In the screenshot above, we have selected "Entity1" in the class diagram (same effect as selecting Entity1 from the Tigerstripe Explorer). Let's create a "Design Note" on Entity1. * the active selected element. Select "Design Note" and hit finish. To access Annotations values from a plugin Template, you use all the "annotations"-related methods on the IModelComponent interface, which is implemented for all model components (Artifacts, methods, attributes, literals, etc...). For a complete list of the methods related to accessing Annotations on a IModelComponent, check out the Tigerstripe Javadoc as included in Help->Help Contents->Tigerstripe Base API in your Eclipse Install with Tigerstripe Workbench. This article will take you step-by-step through the definition of a new Annotation Scheme for Tigerstripe Models, and will show how to consume the annotations from a M1 Generator Plugin. Note: The information doesn't have much specifics to Annotating Tigerstripe models. The same steps can be applied when defining annotation types not target to Tigerstripe model artifacts. Design Notes: that will contain a large Text Box to capture some human readable note. TODOs: that will denote the fact that some more work is required on a model component, by providing a "summary message" in a smaller-one-line text box, and a boolean attribute allowing to specify whether a "hack is in place". We will then create a plugin that will use these annotations to generate a "design report" about all artifacts, highlighting any design note on each artifact and some potential TODO list. First things first, let's define the annotation types that will be presented to the end-user. 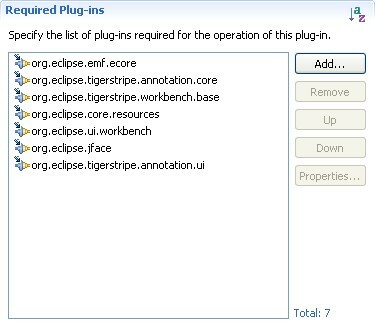 Annotation types are defined through an EMF .ecore file that needs to be packaged into an Eclipse Plugin so it can be installed. 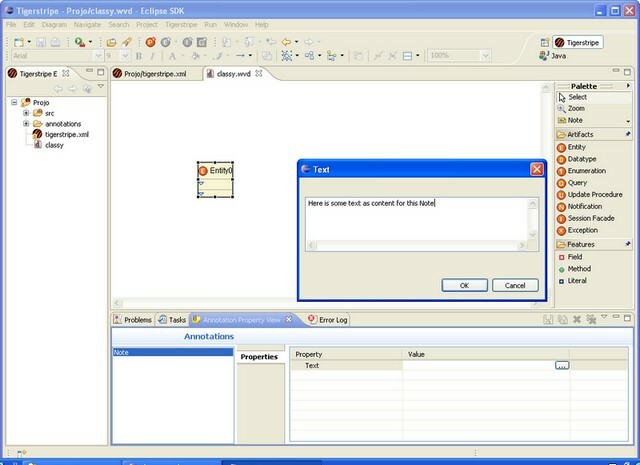 This plugin will need to be present on the end-user Eclipse install for him/her to see the corresponding Annotation Types. The easiest starting point is to create a new EMF Plugin. 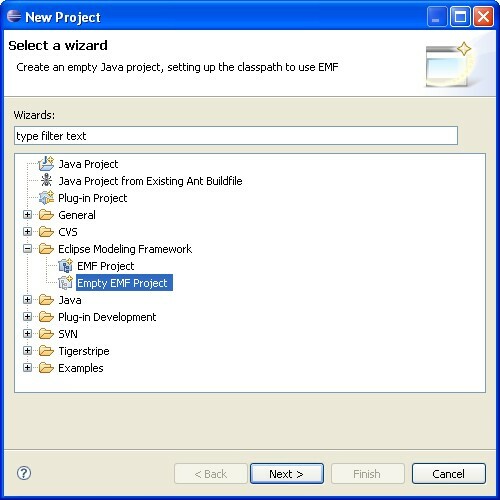 Select File->New Project->Eclipse Modeling Framework->Empty EMF Project. In this example, we'll use org.eclipse.tigerstripe.annotation.example.designNotes for a name. These are required to access the necessary Extension Points defined by the Tigerstripe Annotation Framework (TAF). additional EMF EAnnotations can be used to drive the rendering of the field in the UI. In this case make sure the Text for the Design Notes allow for multiline text. More details can be found at . The nsURI defined here for the package will be used to determine the filename of the annotation store, where all user annotations will be stored. In fact for each nsURI, a .ann file (in this case org.eclipse.tigerstripe.annotation.example.designNotes.ann) is created in the target Model Project to store the annotation values. 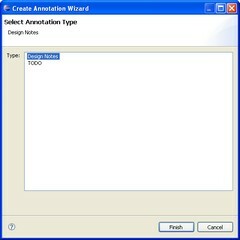 Storing of annotation values goes to the Eclipse install for all non-tigerstripe related annotations. Tigerstripe defines a specific Router to ensure annotations are persisted in the context of the Model Project, so the values can be versioned through the same SCM. Here again more details about "annotation routers" can be found at . Note that we have defined specific target types for these 2 annotations ('IModelComponent'), which means only Tigerstripe Model Components will be "annotable" with these 2 Annotation Types. This will make the Annotation UI offer these annotation types to the user, only when a Tigerstripe Model Component is in focus. Without this, the "scheme" of the URIs used to store the annotations won't be "tigerstripe://..." and the "project routing" won't occur, reverting to storing the annotations in the local Eclipse install instead. Optionally, we can define Label Providers for both annotation types to pretty up the UI. This page was last modified 12:27, 5 November 2008 by Eric Dillon. Based on work by John Worrell.